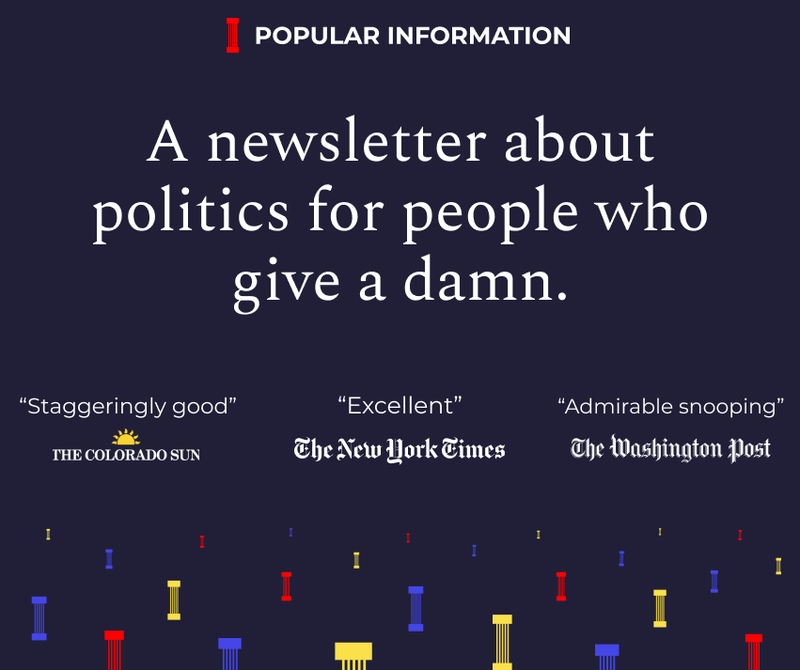 Welcome to a bonus edition of Popular Information, a newsletter with original research and fresh insight into the political news that matters most — written by me, Judd Legum. Popular Information made waves in 2018, which I detailed here. But we are just getting started. You can support independent, accountability journalism by becoming a paid subscriber. Get Popular Information four days a week for all of 2019 for just $50. Or, you can also start with a monthly subscription for $6. If you have any questions or feedback, I'd love to hear from you. Shoot me an email at judd@popular.info. Sears is widely viewed as a story of the old economy. The once mighty chain that revolutionized the retail industry -- it brought catalogs, house brands and store credit to the masses -- failed to pick up on new trends powering companies like WalMart and Amazon. That is certainly part of the story. But what's happening at Sears is also about what's dysfunctional about today's economy. Corporate America has become financialized. Many companies, including Sears, are no longer operated to benefit workers, consumers, or even common shareholders. Rather, they are viewed as a financial asset that is manipulated by those in control to extract the maximum value. The actual work performed and the product offered is virtually irrelevant. Sears is in bankruptcy and teetering on the edge of liquidation. Soon it may no longer exist. But to understand the future of the American economy, you have to understand Sears. Hedge fund tycoon Eddie Lampert purchased Sears in 2005 for $11 billion, merging it with Kmart, which he acquired two years earlier. He became chairman of the board and later CEO. As competitors made big investments in their stores, Lampert's strategy was to spend little and maximize cash flow. He took the profits and, instead of putting them back into the company, invested them in other assets. Sales were declining but, for a time, the strategy appeared to work. Sears' stock hit an all-time high in April 2007. The Motley Fool named Sears its "Best Retail Stock" of 2007. But deteriorating stores, outdated products, and declining sales eventually caught up with Sears. The company last turned a profit in 2010. It began shuttering thousands of stores and running out of cash. Lampert then started selling Sears' most valuable assets to his investment company, ESL. He sold Sears' valuable Land's End line to himself in 2014. Proceeds from the sale were paid out in a special dividend -- which he benefited from as the largest shareholder. In 2005, Lampert sold 235 of Sears' most valuable pieces of real estate to a new company, Seritage Growth Properties, that Lampert chairs. Sears pays the new company over $200 million in rent and other fees each year. Sears was out of cash, but Lampert kept the company afloat by loaning it money. Sears now also pays Lampert over $200 million per year in interest. Lampert attempted to keep the company going by selling himself its Kenmore appliance line but this time, facing allegations of self-dealing, the company did not accept the $400 million offer. Sears declared bankruptcy in October and Lampert stepped down as CEO. One of the reasons the details of Sears' bankruptcy don't get a lot of attention is that it's complicated. I reached out to the anonymous author of PETITION, a great newsletter that focuses on disruption, to explain exactly what's going on and why it matters. Let's start with the basics. When a company like Sears declares bankruptcy, what happens? We're gonna try not to put your readers to sleep. A bankruptcy filing triggers a number of things. First, it draws a line in the sand between pre-filing and post-filing obligations. Pre-filing obligations go into a box, the "estate," and post-filing obligations generally get treated in the ordinary course of business. All pre-filing enforcement actions are "stayed" from proceeding upon the filing. This is important because it allows a debtor company like Sears to quantify what its obligations are based on a set point in time without the distraction of dealing with various creditors banging down its door seeking to collect for amounts owed. Bankruptcy is also a court-supervised process. So while the filing creates what's called a "debtor-in-possession" -- which means that management generally stays in place -- it also means that anything the company wants to do outside of the ordinary course of business needs to get the court's blessing. There is also an Official Committee of Unsecured Creditors ("UCC") to contend with. This is a significant player: it represents various unsecured creditors (i.e., landlords, vendors, suppliers, employees, litigation counterparties, et al.) and has an important seat at the negotiation table. The court can also give the UCC the power to go after parties for preferential payments and fraudulent conveyances. The UCC is threatening to do precisely that to ESL, Lampert's investment company. The case hasn't gotten to that point yet, but the UCC is investigating potential claims and views that as a real source of potential recovery for them. In light of Lampert's role as CEO of Sears at the time the deals with ESL were struck, the UCC may be right. What are the details of Lampert's proposal and why is it controversial? It's critical to understand hierarchy in bankruptcy. If you're providing services to a company after it files bankruptcy, you are first in line. This includes professionals and suppliers still shipping goods and vendors still providing services. Then, per the Bankruptcy Code, secured creditors from before the bankruptcy filing have to be paid in full before junior creditors get anything. But all creditors are paid before equity holders (people who own stock). So a lender who has a security interest in all of Sears' inventory, for instance, will be first in line to collect on that inventory relative to a landlord. But the landlord, as a general unsecured creditor, is ahead of your sweet Nana who, for inexplicable reasons, still holds Sears stock. Poor Nana. Secured creditors have another benefit. They can "credit bid" their debt. That just means that they can offer to cancel their debt in exchange for the assets. That's what ESL is doing. He's saying, "My bid is $4.4 billion!" But is that bid really new value? Is he showing Sears the money? Not with the credit bid portion of his bid: he's just canceling debt, and that does nothing for other Sears creditors or, frankly, for Sears in terms of arming it with liquidity to invest in the business. He IS, however, offering approximately $950mm of cash, provided that he can get financing from big banks. And then there is the assumption of liabilities. He's offered to assume approximately $1.1 billion of liabilities, including severance. That's a big factor if you're a former employee of Sears. In a liquidation scenario, it's rare that employees get their severance. One big issue, however, is that Lampert's initial bid didn't provide enough new value even to cover the costs Sears is racking up during the bankruptcy (called "administrative expenses") let alone unsecured creditors. On Tuesday, there was a status conference in front of the Bankruptcy Judge. At the status conference, Lampert bought himself some additional time to come up with a more compelling offer by agreeing to put down a cash deposit and by promising to up the ante. As we answer this, there are reports coming out that he has upped his offer to $5 billion in total consideration. Per CNBC, "As part of the new bid, Lampert will assume tax and vendor bills incurred since Sears' October bankruptcy, the person said. As with its previous bid, it will aim to keep roughly 50,000 jobs." Said another way, he's offering to cover more of the administrative expenses. So now there's going to be an auction on Monday. The winner of the auction -- which, to be clear, seems like it would be between Lampert's company and firms that specialize in liquidation -- has to have the highest or best offer. Let's be clear about that: the highest figure, e.g., $5 billion, may not be the "best" offer. Creditors may prefer an offer that is more liquid. And the UCC has some serious questions as to whether Lampert should even be permitted to "credit bid" his debt. If he can't, his $5 billion number is inflated, and the liquidators may, ultimately, end up with the highest AND best offer. Bye bye Sears. We'll know more on Monday. Isn't Lampert just doing this to give himself more time to pick over Sears' carcass? Who knows what his motivations are? This unwinding has been a slow-moving trainwreck since he became the owner of Sears/KMart. It's unclear whether he made money, lost money, broke even. He has certainly availed himself of any and all opportunity to strip valuable assets out of the estate and out of the reach of creditors. On the flip side, Sears, believe it or not, still generates double-digit billions in revenue a year. With a focus on the 450 most profitable stores, perhaps he can pull a rabbit out of a hat. In addition to shedding hundreds of burdensome leases, he'll also be eliminating most of the debt off the balance sheet which means that quarterly interest payments will be much lower and that money can be used to actually...wait for it...INVEST IN THE BUSINESS! What is the impact on the workers at Sears? Crazy as it is to say, the best case scenario is that ESL's bid is accepted and he's given an opportunity to make a go of it with 450 stores. Otherwise, the entire enterprise liquidates and jobs are lost. It's the lesser of two evils. And we'd be remiss if we didn't point out that Lampert has expertly messaged this. Prior to submitting his bid, he indicated that he WOULD BE submitting a bid that saves jobs. Then he put his money where his mouth is. In contrast, the UCC -- which, for the record, is led by two real estate investment trusts who have said, on the record, that they'll benefit if Sears goes away -- has been talking about liquidation. For more, follow PETITION on Twitter. So Sears is a case of gross financial and strategic mismanagement. The company was left to atrophy while the best assets were sold to the CEO. All of these actions were approved by the Sears board. And who was a member of the Sears board for 11 years? Trump's Treasury Secretary, Steve Mnuchin. He was college roommates with Eddie Lampert. In his confirmation hearing, Mnuchin claimed Sears was "already failing" when he joined the board in 2005. Trump met with Congressional leaders today at the White House to discuss the government shutdown and his demand for $5.7 billion for a border wall. Trump began the meeting by repeating his insistence for wall funding. When Democrats, including Speaker Nancy Pelosi (D-CA) and Minority Leader Chuck Schumer (D-NY), objected, Trump asked whether Democrats would support wall funding if he opened the government and waited 30 days. Pelosi said no, and Trump walked out. That was the end of the meeting. Schumer said that he saw "a temper tantrum because [Trump] couldn't get his way." According to Schumer, Trump told them "if I open up the government you won't do what I want." Schumer called Trump's behavior "unbecoming of a presidency." House Minority Leader Kevin McCarthy (R-CA) objected to the criticism of Trump's behavior, stressing that Schumer didn't even mention that Trump brought candy. The shutdown, which has lasted 19 days so far, has resulted in 800,000 federal workers being furloughed or forced to work without pay. Things will get worse starting tomorrow when these workers will miss their first payday. The "average take-home pay for many members of the American Federation of Government Employees is about $500 a week." Workers rely on their paychecks to pay for basic expenses like rent and food. The shutdown could soon start to create economic disruptions -- evictions, repossessions and late payments that could take years to remedy. Although federal workers are expected to be paid back when the government eventually reopens, federal contractors are not so lucky. Even Americans who don't work for the federal government face risks from an extended shutdown. The FDA has "stopped most food safety inspections," putting the health of every American at risk. “It’s not business as usual, and we are not doing all the things we would do under normal circumstances. There are important things we are not doing,” FDA Commissioner Scott Gottlieb told NBC News. Just last month, there was an "outbreak of E. coli infections linked to romaine lettuce." The government has also stopped issuing small business loans, and there may be delays in processing tax refunds.